Braids are one hairstyle that never gets old. From ribbons to fishtails, people are always finding ways to reinvent this age-old style. Try these hair updos with braid for a classic look that’s always trendy. 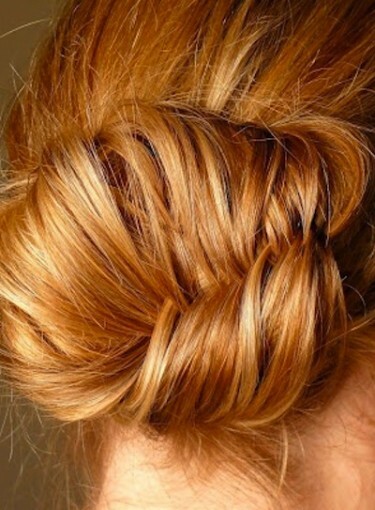 This style is easiest when your hair is slightly dirty, as it will be a little easier to braid. Part your hair to the side and begin a French braid down the side of your head, looping it around to behind your ear. When you’re done with the braid, simply coil it into a bun for an intricate, simple updo. To dress this bun up, pair it with chandelier earrings. This style is ideal for a prom or wedding. Start by braiding hair in a side fishtail braid. If you don’t know how, view this fishtail braid tutorial. Tie off the end and begin loosening up the braid by "smooshing" it and pulling it from either side. Coil the braid into a bun so that the fishtail criss-cross is facing out. Make sure it’s pretty loose and slightly messy looking so it doesn’t look too "done". Secure with bobby pins. This bun will look so complicated that everyone will ask you where you got it done, but it’s incredibly simple once you master the fishtail. Almost any updo can be improved upon with a braid. For more updo ideas, check out these prom styles to steal.